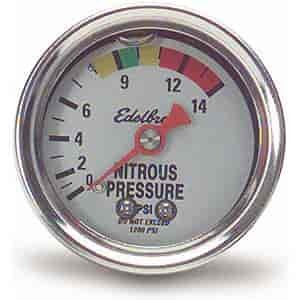 Nitrous system mechanical pressure gauges are an important element in maximizing and tuning your nitrous system. The 1-1/2'' gauges may be fitted onto a nitrous bottle or just in front of the nitrous solenoid. A high-quality engineered mechanism provides durability and accuracy. Braided stainless steel lines are recommended for high-pressure applications. 2-5/8'' gauges come with all necessary adaptor fittings.